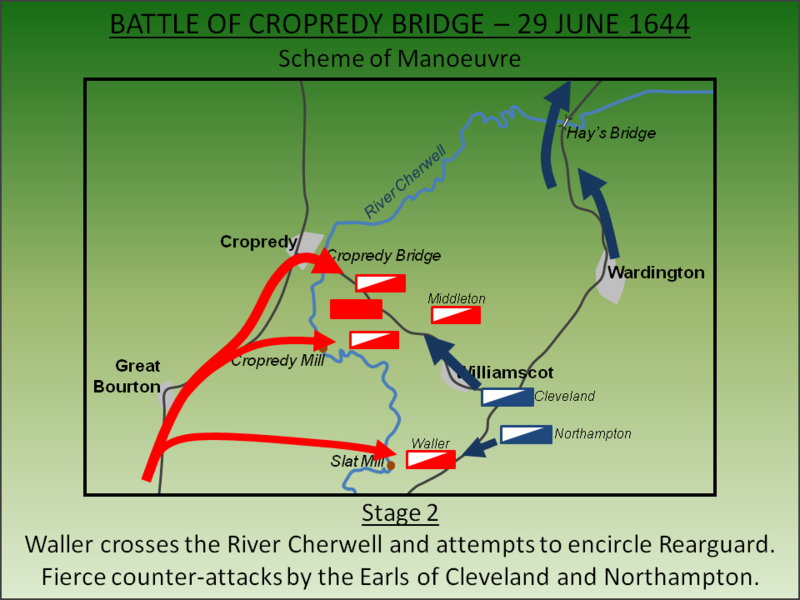 At the Battle of Cropredy Bridge a Parliamentary force under Sir William Waller attempted an opportunist but daring attack against the King’s army. The attempt failed and led to the short term neutralisation of Waller’s force enabling the Royalists to overwhelm and defeat the Earl of Essex in the South West. By Summer 1644 Parliament had three armies in the field in southern and central England. The main force was under the command of Robert Devereux, Earl of Essex who had been tasked with putting pressure on the Royalist capital at Oxford. The second force, the Eastern Association, was under the control of Edward Montagu, Earl of Manchester who was holding the east of England against likely attack by a resurgent Royalist presence in Lincolnshire. The third army was under the control of William Waller who had just secured Hampshire for Parliament with a victory at the Battle of Cheriton. Whilst Parliament was keen to combine their armies to form a large enough force to overwhelm the King, the respective commanders were fiercely independent. Nevertheless, whilst it was accepted that the Earl of Manchester had a pressing requirement to stay in the east, Waller was ordered to rendezvous with the Earl of Essex. He duly did so and, with Essex, put pressure on the Royalist garrisons surrounding Oxford; by May 1644 the King had been obliged to withdraw his forces from both Reading and Abingdon as a result of the movements of the combined force. To counter the new threat, the King deployed his forces from Oxford and targeted Waller's supply lines before withdrawing towards Worcester. The impulsive Waller detached his army and pursued the King but Essex did not follow; instead he moved towards Lyme (now Lyme Regis) in the South West in order to relieve a Royalist siege led by Prince Maurice. 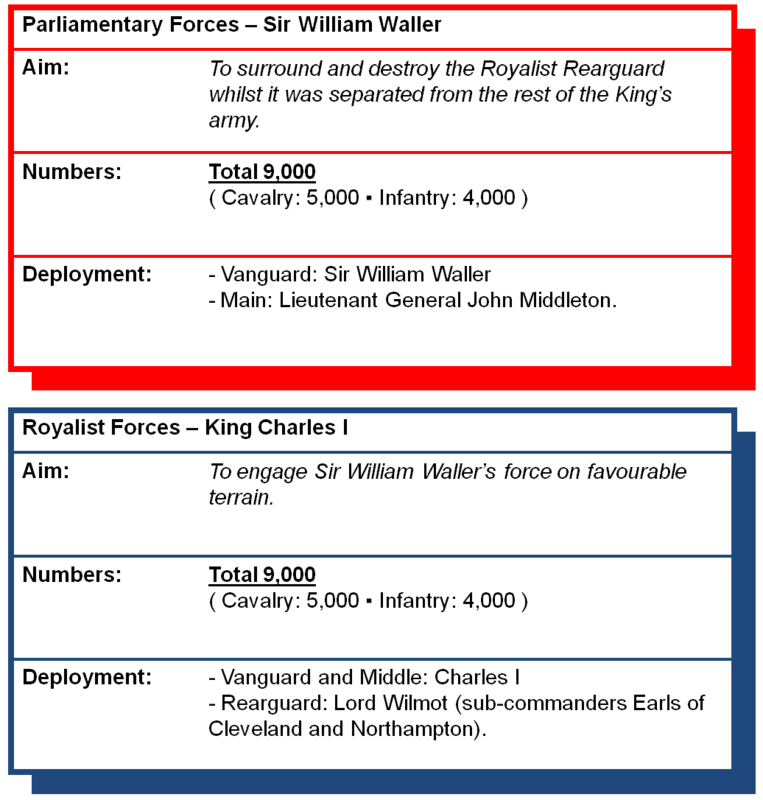 Despite not being supported by Essex's forces, Waller's forces were numerically equivalent to the King's and he sought to engage him. After fooling the Parliamentary commander into thinking he was making for Shrewsbury, which brought the King time to rendezvous with the forces of the Oxford garrison that had marched out to join him, the Royalists waited for him at Banbury. Waller arrived at Banbury on 27 June and drew up on Crouch Hill but the position was too strong and the King was not prepared to attack. Accordingly the following day the Royalists moved north along the eastern bank of the River Cherwell towards Daventry doubtless hoping to bring the Parliamentarians into battle on ground of their choosing. Waller followed on the western side. The Royalist army was under the overall command of King Charles with an overall force of around 5,000 infantry and 4,000 cavalry. The Parliamentary force was of similar size and configuration to the Royalists under the command of Sir William Waller. On the morning of 29 June Waller was at Great Bourton, less than one mile from the Royalist Rearguard but separated by the River Cherwell. 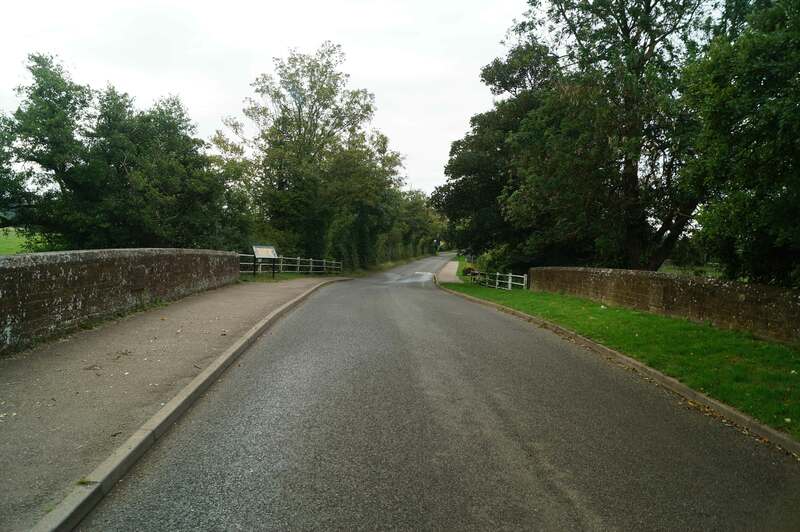 Both armies continued to advance broadly north but the path of the River meant that the Royalists would need to cross at Hay's Bridge if they were to continue towards Daventry. The King was aware of the crossing at Cropredy and deployed a small force of Dragoons to the bridge in order to hold it and secure his flank. He was also aware of reports of a mounted Parliamentary force to the north of Hay's bridge and sent a significant portion of his cavalry north to secure it with the infantry following as fast as possible. The net effect of this was the Royalist Vanguard and Middle Guard moved well ahead of the Rearguard. From his position at Great Bourton, Waller received reports on the increasing distance between the main body of the Royalist army and the Rearguard. 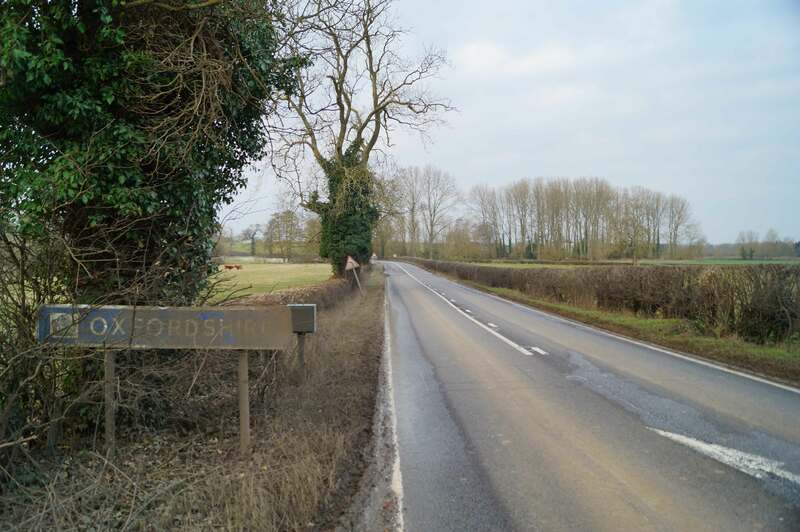 He saw an opportunity to launch an attack on the dispersed enemy line; a small force would advance to Hay's Bridge via Wardington to prevent the main Royalist force from retracing their steps whilst the rest of his army would encircle and destroy Lord Wilmot’s Rearguard. 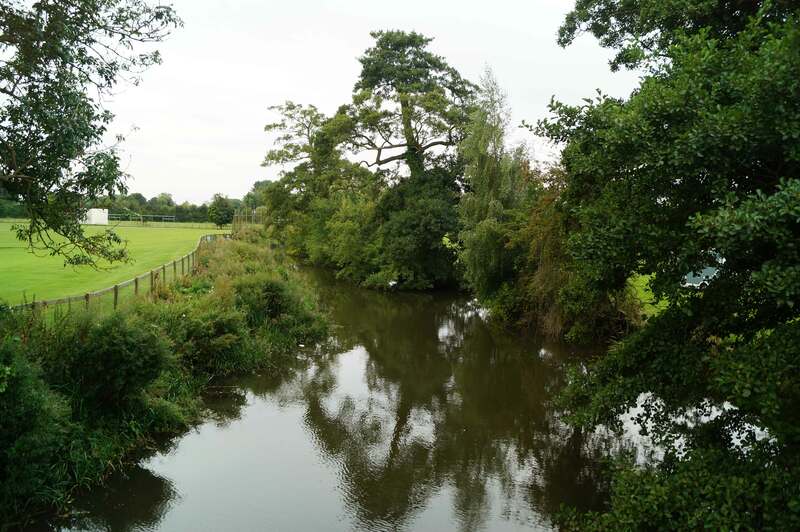 Waller led his main force across the River Cherwell at three locations; Middleton's forces at Cropredy Bridge and a ford near Cropredy Mill whilst Waller himself led over a thousand of his cavalry over the ford at Slat Mill. Waller's plan plan unravelled almost immediately. In the very rear of the Royalist line was James Compton, Earl of Northumberland who observed Waller's movements and led a determined attack against him. Waller lost ground and was eventually forced back over the River Cherwell his planned encirclement having failed. Middleton fared little better for his own forces became dispersed as they advanced towards Wardington and Hay's Bridge. Thomas Wentworth, Earl of Cleveland - leading the forward part of the Royalist Rearguard - attacked him forcing Middleton into a retreat towards Cropredy. The King now turned around his Vanguard who re-crossed Hay's Bridge and advanced south. Middleton rallied his forces and counter-attacked but by this time the Royalist Vanguard had arrived on the scene. 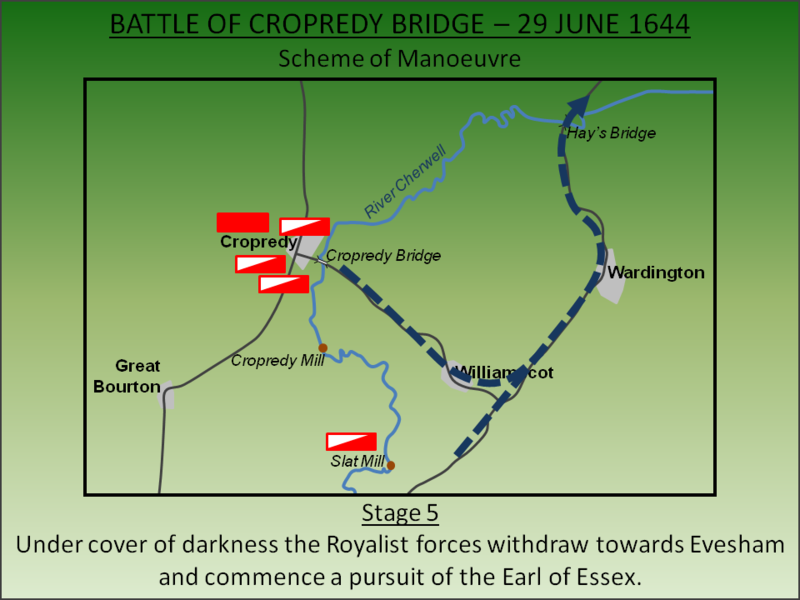 With the King’s support, Middleton was pushed back over Cropredy Bridge losing over a hundred men and all his artillery. 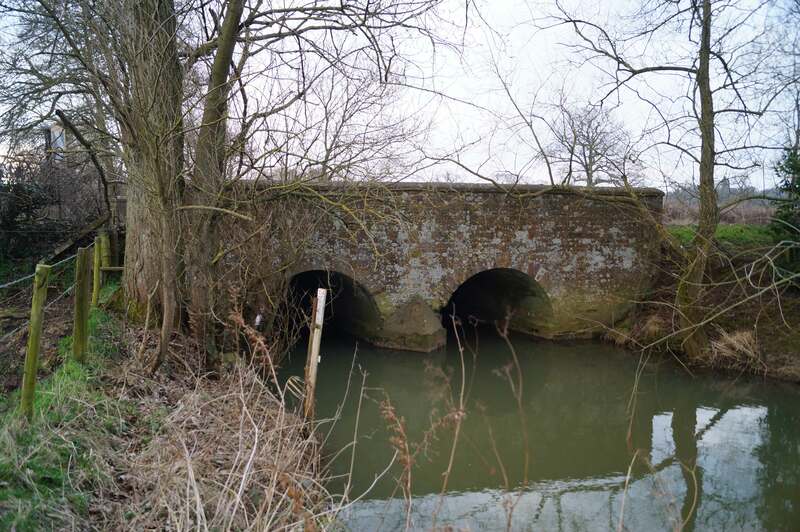 The Royalists had regained total control of the eastern banks of the River Cherwell but did not continue their attack over the bridge or fords as Waller had been reinforced by new arrivals. An uneasy stalemate commenced that continued until dusk the following day at which time the King withdrew. 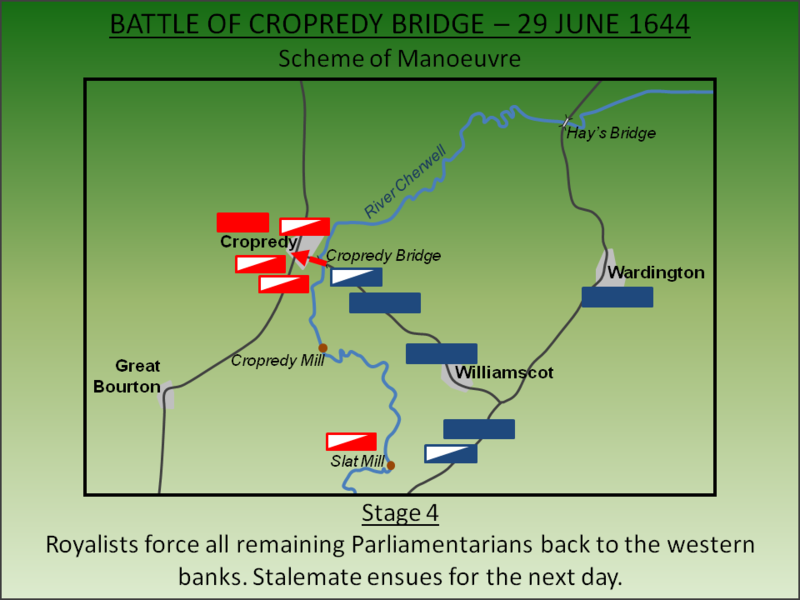 Although arguably an indecisive battle, the defeat at Cropredy Bridge had significant implications for Parliament. The Royalist attack had badly shaken Waller's men with as many as 2,000 deserting in the days following the battle. He was compelled to withdraw to Northampton where he attempted to quell a full mutiny by lobbying Parliament for the armies pay arrears; to all effective purposes his army was at a standstill and effectively neutralised. But for the Earl of Essex this was a disaster - the King now deployed into the South West after him and, sandwiched between two Royalist forces, was defeated at the Battle of Lostwithiel. Adamson, J (2007). The Noble Revolt. Orion, London. Bennett, M (1990). A Travellers Guide to Battlefields of the English Civil War. Webb and Bower Ltd, Exeter. Beresford, M.W and St Joseph, J.K.S (1979). Medieval England - An Aerial Study. Cambridge University Press, Cambridge. Burne, A.H (2005). Battlefields of England. Pen and Sword Books Ltd, Barnsley. Douglas, D.C, Coward, B and Gaunt, P (ed) (1975). English Historical Documents Vol 5B (1603-1660). Routledge, London. Gardiner, S.R (1889). History of the Great Civil War Vol. II. London. Hunt, T (2003). The English Civil War at First Hand. Orion Books, London. Lancaster, J.H.D (2014). 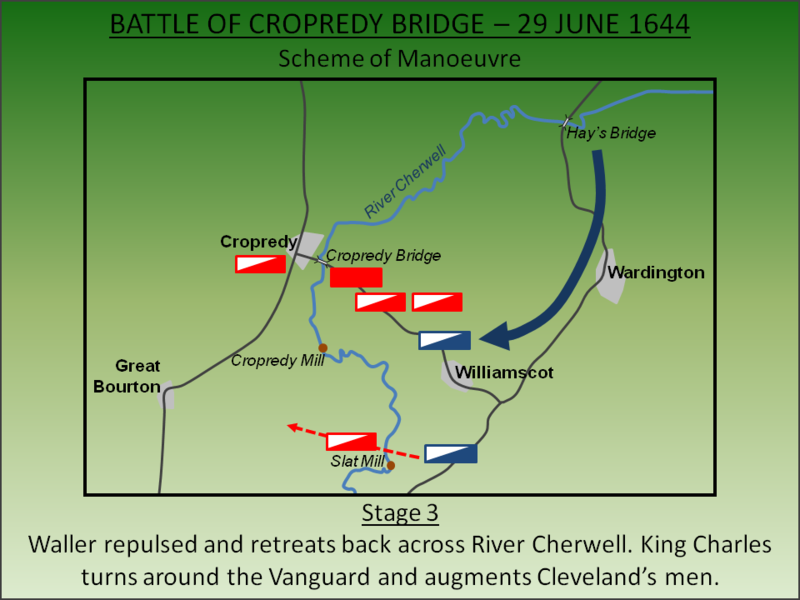 Cropredy Bridge: Battlefield visit notes and observations. CastlesFortsBattles.co.uk. Ordnance Survey (2015). Oxon. 1:1250. Southampton. The landscape has changed significantly from the seventeenth century. The River Cherwell is deeper but narrower whilst the once open fields that hosted the bulk of the fighting have been enclosed. Nevertheless footpaths offer access to most areas although getting to Hay’s Bridge, on the busy A683, is particularly dangerous. Hay’s Bridge. The Royalist Vanguard rushed to Hay’s Bridge in order to cross it prior to a reported Parliamentary cavalry force arriving. The net result was the Rearguard became separated prompting Waller to attack. 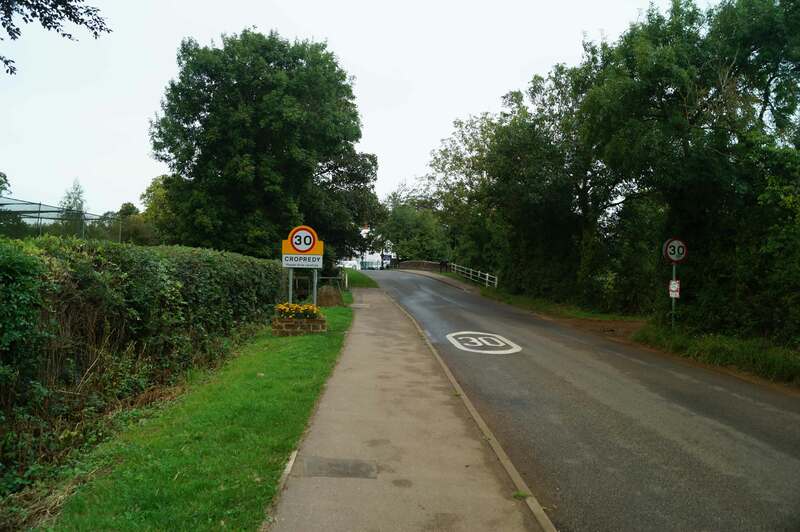 Please be very careful if visiting this bridge as there are no public footpaths and traffic travels at high speed on the busy A-road. Cropredy Bridge. 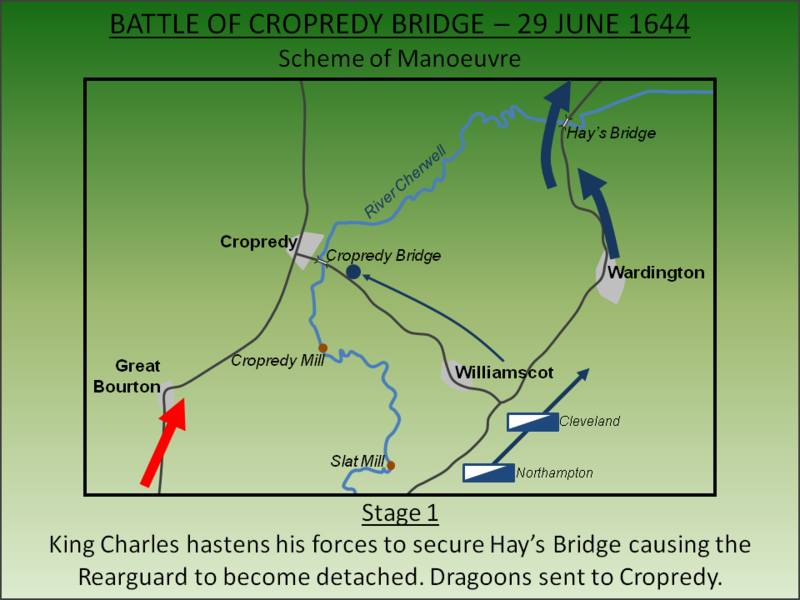 King Charles detached dragoons to hold Cropredy Bridge to secure his western flank as he advanced. Waller overwhelmed them and advanced on towards Williamscot and Wardington but was soon pushed back across the bridge. River Cherwell. Today the river is much narrower but deeper than the seventeenth century. Williamscot. The small village is not much bigger than it was during the battle although the current buildings are modern. It was here that Thomas Wentworth, Earl of Cleveland repulsed the forces of Lieutenant Colonel John Middleham. Wardington. Waller hoped to occupy Wardington to prevent the Royalist Vanguard and Middle Guard retracing their steps. His intent was then to encircle and destroy the Rearguard to the south of the village. Battlefield. View towards the battlefield from near Wardington. 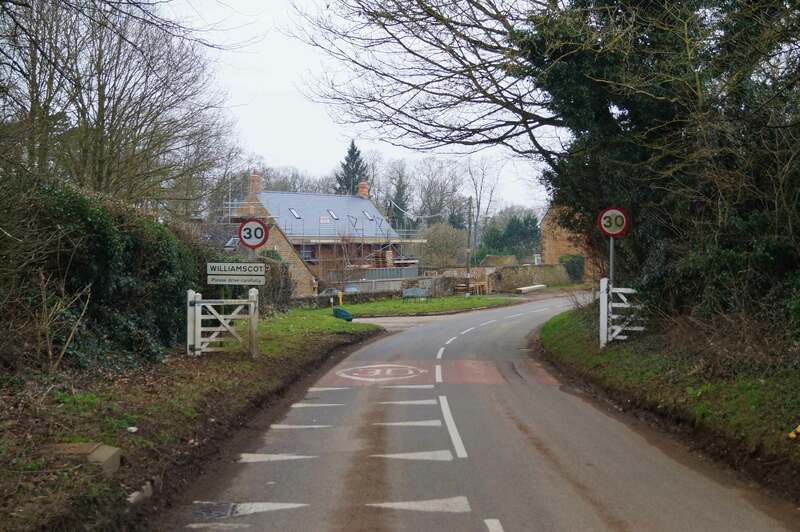 There is parking in immediate vicinity of Cropredy Bridge itself and from here the whole battlefield (other than Hay’s Bridge) can be explored. An information panel gives basic details of the battle but, other than this, there is no monument.